The surname Bruce comes from the French de Brus or de Bruis, derived from the lands now called Brix, situated between Cherbourg and Valognes inNormandy, France. There is no evidence to support a claim that a member of the family, Robert de Brix, served under William the Conqueror during theNorman Conquest of England. This notion is now believed to be have originated in unreliable lists, derived from the later Middle Ages, of people who supposedly fought at the Battle of Hastings. Both the English and Scots lines of the Brus/Bruce family demonstrably descend from Robert Brus, 1st Lord Annandale who came to England in 1106. Robert de Brus was a companion-in-arms of Prince David, laterDavid I of Scotland. In 1124 he followed David north to reclaim his kingdom. When a civil war broke out in England between Empress Matildaand her cousin, Stephen, David I of Scotland led a force into England.However de Brus did not follow David and instead joined the English and at the Battle of the Standard in 1138 he took prisoner his own son, who was now Lord of the lands of Annandale. Robert de Brus, 1st Lord of Annandale died on 11 May 1141 and was buried at Gysburn. 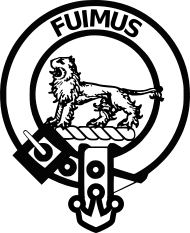 The foundation for the Bruce royal claim came in 1219 when Robert Bruce, 4th Lord of Annandale married Isobel of Huntingdon, daughter of David of Scotland, 8th Earl of Huntingdon and niece of William the Lion. The union brought both great wealth, with the addition of lands in both England and Scotland. Their son, Robert Bruce, 5th Lord of Annandale, known as ‘the competitor’ was sometime Tanist to the throne. On the death of Alexander III of Scotland both Bruce andJohn Balliol claimed succession. Margaret, Alexander’s infant granddaughter was named as heir, however, she died in 1290 travelling to Scotland to claim her throne. Soon after the death of young queen Margaret, fearing civil war between the Bruce and Balliol families and their supporters, the Guardians of Scotland asked the kingdom’s southern neighbour, Edward I of England to arbitrate among the claimants in order to avoid civil war. Edward I saw this as the opportunity he had long been waiting for to conquer Scotland as he had conquered Wales and rule over all the British Isles. In 1292 Edward chose Balliol who swore allegiance to the English monarch. It was not long, however, before Balliol rebelled against Edward, eventually leading to John’s defeat and forced abdication after the Battle of Dunbar in 1296. With the abdication of John Balliol, Scotland was effectively without a monarch.Robert the Bruce swore allegiance to Edward at Berwick-upon-Tweed but breached this oath when he joined the Scottish revolt the following year. In the summer of 1297 he again swore allegiance to Edward in what is known as theCapitulation of Irvine. Bruce appears to have sided with the Scots during the Battle of Stirling Bridge but when Edward returned victorious, to England after the Battle of Falkirk, Bruce’s lands of Annandale and Carrick were exempted from the lordships and lands which Edward assigned to his followers. Bruce, it seems, was seen as a man whose allegiance might still be won. Robert the Bruce’s son, David II of Scotland became king on his father’s death in 1329. In 1346 under the terms of the Auld Alliance David marched south into England in the interests of France, but was defeated at the Battle of Neville’s Cross and imprisoned on 17 October of that year, and remained in England for eleven years. David returned to Scotland after negotiation of a treaty and ruled there until he died in Edinburgh Castle unexpectedly in 1371 without issue. The line of succession passed to the House of Stewart.